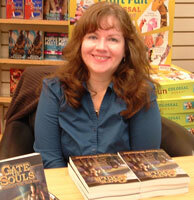 Please welcome Verna McKinnon, an author of fantasy and science fiction. a) What do you enjoy most about writing? Creating new worlds and telling stories. I have always had an active imagination. I like to create stories I want to read. b) What age did you start writing stories/poems? I use to make up stories as a kid. I was always interested in writing, but too shy to admit it for a long time. c) Has your genre changed or stayed the same? Fantasy and Science Fiction has always been my main genre. I am a proud Nerd Princess. d) What genre are you currently reading? Fantasy & Science Fiction. I’m so easy. e) Do you read for pleasure or research or both? Both. I love researching cultures, history, and mythology. I am a secret academic from that perspective. As an author of fantasy and science fiction, it is invaluable to create worlds and cultures in my stories. You want to develop something tactile and fully dimensional for the reader. f) Who is your best supporter/mentor/encourager? As an adult-my husband, Rick Hipps, who is also a great writer. As a kid-Star Trek-and many other attempts at science fiction on TV when I was a kid. 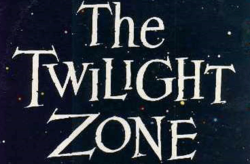 I love imagination and where it can take you-I also loved Twilight Zone & Outer Limits. Plus it was the only place where women had more to do than bake pies. I was a little kid but they held more interest for me than other things, and it gave me an interest to read the literature on my own. g) Of the characters you have created or envisioned, which is your favorite & why? Wow. That’s tough. I have many I love-even my bad guys like Koll the Sorcerer or Obsydia the Bloodstone Queen. But Belwyn the owl from my Gate of Souls novel is a favorite. He is the bedrock that takes care of Runa, Mellypip, and Cathal. Belwyn is a thousand year old owl familiar with a sharp wit and sharper beak-he takes care of everyone and brooks no nonsense. His dialogue is some of the best. He has a dry wit and does not believe in false morality. He has faced down a heap of evil and tragedy in his life, yet he is the caretaker of the group. h) Where is your favorite writing space? My study at home with all my little creative pictures and things around me. Also I love the Seattle coffee shops. If you give me caffeine and sugar, I am pretty happy. i) Do you plan your stories, or are you a seat of the pants writer? I must admit I start out as a seat of the pants writer on some levels. I was that way with my first novel. All in my head and I just wrote. I am better now. I get an idea and I go with it. I have scraps of paper and notebooks I fill with the idea for a book. My initial writing is chaotic with the new idea. Then when I have written some bits and feel it can grow into a real novel, I begin to format my world/story bible and detailed characters, religion, cultures. k) Do you belong to a writing group? If so which one? Alas, I am alone in Seattle. I want to belong to one again. Anyone want to adopt me? l) Do you have a book published? 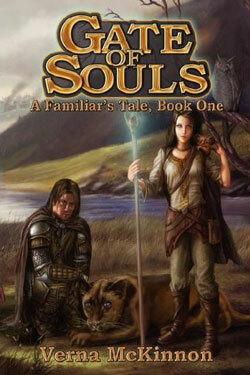 Gate of Souls, A Familiar’s Tale Book 1. It is published though Aberrant Dreams Publishing. I am available in hardback, softback, and Kindle. You can find me online at Amazon.com, Booksamillion.com, Barnesandnoble.com, & Aberrant Dreams website. It is a 4 book series and the next book, Tree of Bones, will be out when the cover art is done and we do galleys. m) If you could meet one favorite author, who would it be and why? There are so many I admire. Sadly so many of my favorites, like David Eddings, Roger Zelazny and Ray Bradbury, are gone. I do love classic fantasy literature so unless we can summon Robert E Howard from the grave, one of my living writing idols is Tanith Lee. Her “Tales of the Flat Earth” and “Birthgrave” series rock. n) Where can readers find you and your blog? www.vernamckinnon.com. That is my website and my blog is there too. You can read me pontificate on the process of being a forlorn Princess of Heroic Fantasy. I also will welcome anyone who wants to be a follower on my blog-no weird cult stuff, just writing wisdom and some humor. o) Do you have plans or ideas for your next book? Yes-I am working on two novels now. The 3rd in my Familiar’s Tale series, Fires of Rapiveshta, (this one has lots of dragons) and Bard Maiden of Rhulon, a new heroic fantasy novel with a female heroine, Rose Greenleaf, a Dwarven Bard who flees an unwanted marriage in her home of Rhulon for adventure with the tall folk in the southern kingdom of Tirangel. Well, she gets her adventure-a little more than she can handle too! Thank you Verna for a wonderful interview.